Filming in Mainland China in recent years, Bernice Liu (廖碧兒) was met with mediocre results. Bernice shifted her interest to business, investing $10 million HKD to buy a winery in France. After opening a smokehouse last year, she followed with a new bar in Central, Hong Kong. Bernice’s sudden cash flow and new lofty lifestyle sparked speculations that she is dating a new wealthy boyfriend. 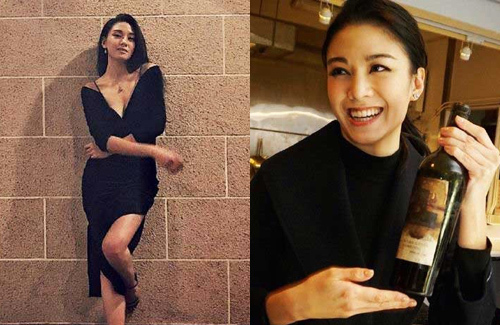 Moving out of her condo in Tseung Kwan O, which she had resided with her parents, Bernice’s new home is a $10 million HKD residence in the Forest Hill development in Tai Po, an affluent area in the Mid-Levels. Although her father had acted as her chauffeur before, Bernice chose to hire a new female driver instead. While celebrating her 38th birthday earlier in January, Bernice met with several female friends for afternoon tea. Around 10 p.m., Bernice’s chauffeur picked her up and drove to a luxury residence on Guilford Road near The Peak. Speculated to be visiting her boyfriend’s house, Bernice was not seen leaving the building even in the dawn hours. Bernice’s past boyfriends include Moses Chan (陳豪), Hawick Lau (劉愷威) and wealthy businessman, Alistair Lam (林忠豪). The identity of Bernice’s new boyfriend is unknown, but she appears to manage the relationship carefully, choosing to mingle with only female friends recently. To stay in optimal shape, Bernice has been taking yoga classes and visiting the beauty salon on a regular basis. I have a problem with this article. They have NO evidence about a boyfriend but they’ve already made up the story that he must be wealthy. Why are they still trying to depict Bernice as some gold digger? That whole issue with Alastair was not fair at all. She had already broken up with Moses (I don’t give a crap about him anymore after that). Who cares who she dates?! She has money herself, so why the hell does it matter whether the guy does? When Kathy Tsui married her rich husband, no one painted her out to be a gold digger, just someone who was extremely lucky. The media is so freaking biased. I suspect those who didn’t make it into the entertainment business but ended up as ‘reporters’ like to create drama as compensation for their own failures. @msxie0714 Yes, you have to be quite heartless and vile to be a reporter. The media has the power to ruin someone’s image just like that. What a scary thing. totally agree with u on cathy tsui…nobody said she was a gold digger when apparently she is…she ditched timmy hung for her rich husband. @kllang7979 Exactly! Her parents didn’t think Timmy was good enough for her. They only wanted a rich, successful husband for her because they had invested so much in her already – she went to college, etc. It’s normal to want the best man for your daughter, but when you turn your nose up over people who you deem are inferior to you only due to social status, you’re not a very good person. Money isn’t everything. Bernice has honestly never done anything to piss off the media. She was always happy-go-lucky. They just wanted to sell magazines. I curse TVB for taking Moses’s side when paps accused Bernice of cheating. He wasn’t enough of a man to admit to their relationship, or even hold her hand in public while they were together. He did not even have the decency to tell the media they had already broken up, so she could date anyone she wanted. He played victim! But of course the next girlfriend, now wife, was allowed to flaunt their relationship right away like a PR stunt. Or maybe she can afford the new apartment because her business is generating positive returns and there’s also such thing as a mortgage/loan from the bank. The reporter who wrote this article is either sexist or extremely biased. So because she’s successful, it’s assumed she must have a wealthy boyfriend?? Seriously, what was the person smoking?! @myxx @lyu310 That’s typical HK media for you! Oh, and the source of the article shows East Week, which has absolutely no credibility whatsoever in my book after they themselves even admitted to making up stories based on pictures they obtained. Besides, most of the HK media still live in the Stone Ages and also still hold fast to stereotypes and ancient-thinking of how they think the world functions. I’m actually not surprised that these reporters would write such stuff – to them, it’s unfathomable that someone like Bernice can possibly survive on her own without having to rely on a wealthy man to supply her with endless riches. HK media is also kind of unique in that they delight in giving their entertainers a hard time and seeing them suffer. Leslie Cheung said it best many years ago when he criticized the HK media for being hell-bent on destroying and hurting their own entertainers with their unscrupulous and constant false reports. Being a celebrity does not mean they are supposed to get zero privacy the rest of their lives or that they deserve to have stories made up about them because it “comes with the territory”. Unfortunately, HK media is the worst of the lot – at least with other places, it’s easy to find at least 1 or 2 media sources that are ethically decent and relatively credible…in HK, there are basically NONE…..
@lyu310 Yea, when it comes to “underground relationship,” the female is usually at the short end of the stick. Unfortunate. @myxx IKR? Media has been more “critical” to actresses/celebs than their male counterpart. When Joel Chan dumped his wife to date that rich heiress, he hardly had any backlashes. And that was public! With Bernice, this is all just speculation and guessing. Ridiculous. @jjwong Yes! Joel Chan is the perfect example of scum. But even after his breakup with socialite Florinda, he was able to pick up his career. How is that fair?! The double standard female celebrities face, especially in Asia, is ridiculous. Like how can this reporter write all about her business and how she’s doing well, AND THEN somehow claim she’s living lavishly due to a made up wealthy boyfriend? It takes a very high EQ to be a star. I would not be able to handle the BS they have to face on a daily basis. @lyu310 The word scum should be used very carefully, as much as a materialistic woman which is what Bernice is accused of, in a friendly way because the not friendly way is quite simply saying she is living off the money by her wealthy boyfriend which this article emphasises. It is simple. if her current income can’t support her current lifestyle, then it is not wrong to speculate she got a sponsorship. But the man who paid for her lifestyle if true is the idiot, not her. She is Bernice Liu. She is a celebrity, and a pretty one. Those don’t come cheap. It is an investment. As for Joel, so he broke up with Florinda, so? Why should that merit him not having a job and putting food on his table? What did he do that was so terrible? If he cheated on her, punishment can’t be forever. If they just broke up, it is very normal in any world, not just celebrity world except for celebrities, they are magnified. And breaking up with Florinda may be the best thing to have happened to him. Because he now works hard, not putting too much effort over being the boyfriend and now earning his dues. That is a good thing. Because unlike Bernice, she can find someone to sponsor her as she does other stuff but for men, well, the double standard is men have to earn a living by working in a job that pays them that living. There is a term for that for women but I feel that is too low to go. Anyway celebs have to keep up an appearance. If you are famous enough you get ads and sponsors and even if you are rich enough you get the same ads. Gotta look good 24/7, never be sick, be friends with media. Tough life for men and women. But if you choose this life, you choose the perks (becoming modern day royalty and undeservedly so) and you have to accept the BS that comes with it. Which is why they’re highly paid. Doesn’t need high EQ. Just believe in their own awesomeness and build up an ego to match and yet believe in own humility when there isn’t any. @funnlim I think we’re talking over each other’s head, i.e. comparing apples and oranges. I’m not saying having a “sponsorship” or a career after a high profile is a bad nor a thing to look down upon. (I don’t think @lyu310 is saying that either.) The double standard is that when an actress does it, the media burns her at the stake; but when an actor does it, it’s hardly any mentioning or portraying he’s not “even worthy to a dog.” In Bernice case, it can’t even be confirmed that she does have a “sponsor.” Yet the media is already throwing stones and casting fires automatically. Even you are already assuming she does have a sponsor because she’s a pretty ACTRESS and needs maintenance. In Joel case, it was pretty obvious that he dumped/divorced his wife to go after the heiress (regardless of cheating or not). His actions spoke loudly. Yet he had hardly any articles, news, paps, written badly of him and his character. Like I said, I’m not against having a sugar daddy/mommy, each to their own. I’m more bothered by the fact that media likes to attack on female more and let the male slides. It’s not a double standard “that man has to earn a living while woman finds a sponsor.” This is a stigma, looking through a tinted glasses if you will. People think that’s how it’s supposed to be or how it is. However, woman CAN and DOES earn a living (Bernice might be doing so, but media is just portraying her otherwise.) Man can find a “sponsor” (Joel definitely did). I’m not condemning marrying/dating rich (or to be more PC, finding a sponsorship); I’m condemning media/society judging male vs female for the same action. I agree with you @jjwong. Shirley is actually a good example to compare to Joel, since both cheated on their significant others. The double standard exists, and women are the ones with the disadvantage when it comes to image/cheating. I don’t care if Bernice has a “sponsor.” Speculation is dangerous without proof. And most of my criticism stems from a few years ago when the Alastair Lam incident happened. She was seen with him in a car, and the media had a field day because that meant she was cheating on Moses Chan. Well, they had already broken up, but Moses thought it was the perfect opportunity to play victim. When the media asked for his opinion, he did not stand up for Bernice. Instead, he said “the past is the past.” Why couldn’t he say they weren’t together anymore, so her life was none of his business?! I guess when the media is on your side, you want to milk it for all it’s worth. That’s the main reason Bernice left TVB. Why would she want to stay with a company who didn’t have her back?? They were on Moses’s side. It doesn’t matter if she has a wealthy boyfriend or not. She has money herself so that wouldn’t be surprising. She’s been in the industry for 16 years now. If she was a gold digger, she could’ve done it long ago. Instead, she has her own business. If she has found a wealthy boyfriend now, good for her! But the media has been cruel to her once and they’re doing the same thing. When they come out with actual photos and a name of this man, I will be content. All I ask is for these despicable reporters to prove their claims. The reason why Shirley is not retained by TVB is that simply there isnt a market for her. She had received enough sympathy by playing the role of a mother having a tough time raising her child alone but in reality she is richer than all of us. She didn’t have many fans before the incident and after the incident why would TVB want to keep someone that audiences refuse to watch? The media and forums actually treated her well by covering her as a single mum bringing up the child instead of reminding us that she is a cheat whi had someone’s else’s baby. Joel’s scenario is different is that he has shown remorse and slowly made his way back to TVB by behaving in the correct manner. Even if he didn’t do so, there would be enough interest for a decent supporting actor like him to resume his career. I don’t think the media is being harsh on Bernice at all. If her expenses are enormous and do not measure up to her income then they have to right to assume that someone is donating to her the money. It’s clear that she isn’t generating millions of profits a year from her businesses yet so the money has to come from somewhere. I like bernice! Do wish her all the best! I know lots of the readers here like Bernice Liu and think highly of her. I used to like her too. Bernice dated Harwick Lau when she first joined TVB. She took the advantage of getting Harwick to help her learn Cantonese. Harwick was not popular at that time. Once Bernice became popular and was promoted by TVB, she broke up with Harwick. Then she dated Moses Chan after acting as Moses’s girlfriend in “Love Bond” 心花放. The couple (Bernice and Moses) were well received and accepted by people in Hong Kong. They made a lot of money in shows and filming ads. Bernice became the top actress in making money for TVB during those years. Do you think Bernice wanted to let the media know that she broke up with Moses? It would definitely affect her sources of making money. If she did not want the media know, it would be bad for Moses to disclose the truth. I don’t think we should blame Moses Chan for not telling the truth. He would look mean to tell the media that Bernice was no longer his girlfriend. Moses was truly a gentleman in this case. If anyone has to speak the truth of break-up to the media, it should be the female. Otherwise, it sounds that she is being dumped by her boyfriend. @orchid123 To me, it’s not about liking or not liking an artist, at least not in this case. Personally, I’m not a fan of Bernice’s and I’ve actually never liked her as an actress (her acting is still mediocre even now). I’m also indifferent to how Bernice is as a person or whether she is a gold digger or not (frankly, I don’t care either way) and I don’t follow her news either. I try to look at entertainment news in general from a more objective view in terms of facts and what makes sense – doesn’t matter who the artist is or what my feelings are towards him or her. Some of the stuff that the HK media (especially the gossip rags) comes up with is truly ridiculous and a lot of it is based on speculation as well as baseless assumptions that anyone who takes the time to step back and think about logically (and do some “research” of course) can probably figure out that something doesn’t add up. Unfortunately though, with the gossip culture in HK being what it is (which it has always been since the beginning of time), most people take what those gossip rags print at face value and don’t have the time or interest to dig into what the media is feeding them and see whether it makes sense. I was listening to a radio show the other day that talked about this and mentioned how today’s media companies are actually worse off because most of them hire newbie inexperienced reporters who, instead of taking the time to research and fact-check stuff, they just report whatever sounds like it will attract audiences. Oh, and it also doesn’t help that most of the newer reporters don’t take the time to establish/build good relationships with artists either, which is something that HK reporters in the old days used to do and it served them well due to all the inside information that artists were often willing to divulge, sometimes voluntarily (I’ve noticed this for years actually – when I read/watch interviews / articles done by veteran reporters vs newbie ones, the disparity is pretty obvious in many cases). Well, it looks like this is another case of the HK Media not doing their homework, as usual. Bernice clarified in an interview today that she did not ”suddenly come into a lot of wealth due to a rich boyfriend” as the tabloids reported. The “luxury home” that the tabloids are claiming she moved into recently is one she has actually been living in for 4 years already and is property she bought with her own money (which she also pointed out that those who follow her news from the beginning would know because she’s been saving money since she started in the entertainment industry and also she has businesses that have been doing well, which were also previously reported on). Oh and the “new female driver” thing is bogus too – that’s her assistant who has been with her for more than 10 years and has served as her driver all this time (she’s also a close friend of hers, not some random “chauffeur” she hired to drive her around). She said that perhaps the media misunderstood because she hasn’t been active in HK much in recent years so can’t really blame them (classy response from Bernice if you ask me). So @jjwong @lyu310, your criticism of the HK media in this instance is spot on! Though of course none of us should be surprised, since there is no such thing as “fact-checking” or doing proper research where the HK media / tabloids are concerned. @llwy12 Appreciate the extra info. @orchid123 I’m neither a fan nor a hater of Bernice. I don’t “think highly of her” nor do I care about her break up with Moses. I think her as another person in entertainment or this sort of status. I would’ve still made the same spill if this where any other actress or celebs. This article is just strictly speculation and has no fact. As @llwy12 confirmed, claims in this article are bogus. It’s just unfair for her to have this sort of news. Then again, one can argue any exposure is good exposure or this kind of shiz is what sells. This just doesn’t sit well with me since I believe it further fuels the bias in the media and fortify/prolong the bias mentality in society. @llwy12 Yes, this has digressed to an “eff you media” string of replies lol.